Key midfielder Chris Forrester and goalkeeper Ben Alwnick are both expected to return to training with the Peterborough United first-team squad today (March 10). Forrester, many fans’ tip for the major player-of-the-season awards at the ABAX Stadium, has missed the last four matches since picking up a leg injury in the 3-0 defeat at Millwall on February 20. Posh goalkeeper Ben Alnwick (left) with his brother Jak Alnwick who plays for Port Vale. Photo: Joe Dent/theposh.com. Alnwick hasn’t been seen in the last three matches after rolling an ankle in training. He had a pain-killing injection this week which should enable him to take part in full practice ahead of Saturday’s (March 12) League One clash with Port Vale at the ABAX Stadium. 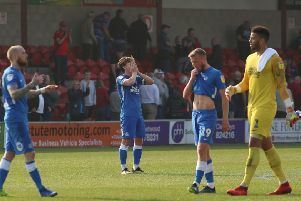 Posh manager Graham Westley said: “Our big players are coming back and we need them to help the younger, inexperienced ones like Simon Gillett did at Wigan last weekend. “Port Vale is a tough game. They looked a strong outfit when we drew with them at their place. “They are workmanlike, but they are very effective at what they do. On-loan 21 year-old Stuart Moore has proved to be an able stand-in for Alnwick and may get the nod to play against Vale anyway. Alwnick’s brother is a goalkeeper at Vale, but he’s also been absent through injury recently. Moore may not stay beyond his initial 28-day spell at the club if Alnwick recovers, particularly as Posh legend Mark Tyler has returned to the club as a player-coach. Posh are stuck in no-man’s land in League One, 10 points from the play-off places and 10 points clear of the relegation zone. But Forrester is still confident of a decent finish. He said: “We know we are capable of going on a good run of form. “We won a lot of matches in a row earlier in the season and this group of players are determined to put together another good run now. “We have had a lot of injuries and that doesn’t help in terms of consistency, but we are getting a lot of the players back now and we are all working hard on the training pitch to improve. “For me personally, it was frustrating to pick up the injury at the time that I did, but hopefully now I can start to help the team.